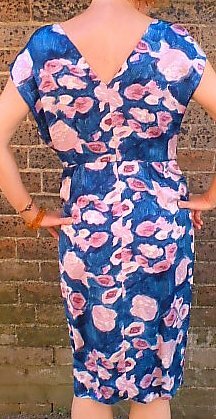 Vintage 1950s summery blue, pink flowered dress. 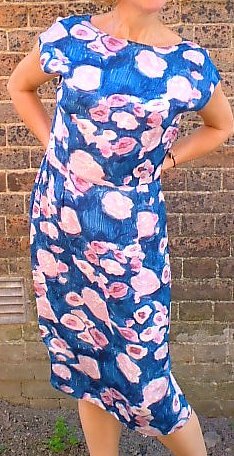 This dress has been hand made from a beautiful blue, silky fabric, covered with pink flowers. 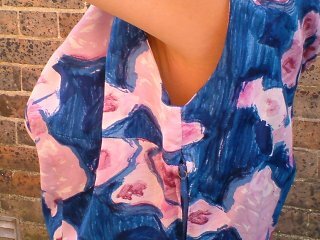 The print is as if the design was painted on, with visible brush strokes, and the flowers are mostly simplistic in shape: this style, and the nylon zip, lead me to date this as late fifties. 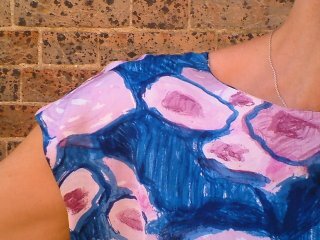 The dress is sleeveless, with a round neck and vee back. Slightly fitted in shape, it fastens with a zip at the side and has little slits at each side at the hem. Although we didn't use one in the photographs, it would probably look good with a belt, too. It's a gorgeous dress for everyday, and you can be sure that it's a one off! The dress is in excellent condition with no marks or stains that I can see, and no rips or tears. Approximate measurements are: underarms, 40 ins/101.5 cms; waist 32 ins/81 cms; hips 42 ins/106.5 cms; length from shoulder, 42½ ins/108 cms.